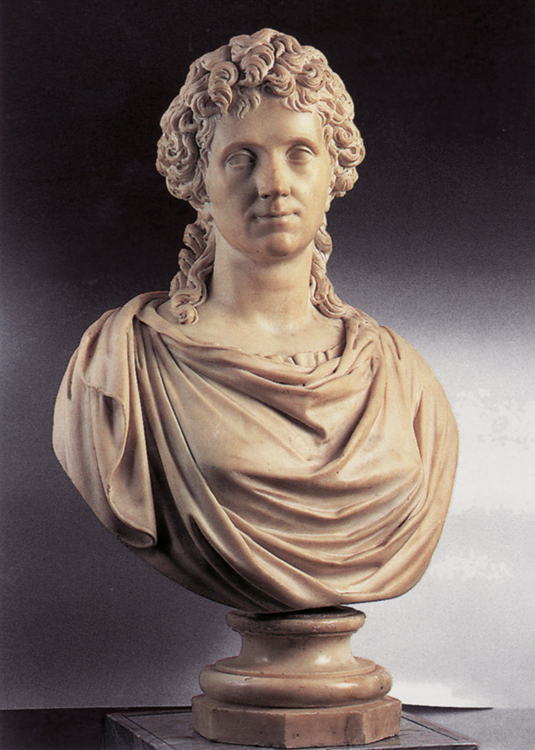 30.10.1741 Born in Chur, today Reichsgasse 57, as the only child of Johann Joseph Kauffmann and Cleophea Lutz. 6.11.1741 Baptized in Chur cathedral. 1742 The family moves to Morbegno (Valtellina). ab ca. 1745 Little Angelica shows artistic talent. Her father gives her drawing lessons, her mother teaches her music and to read and write. 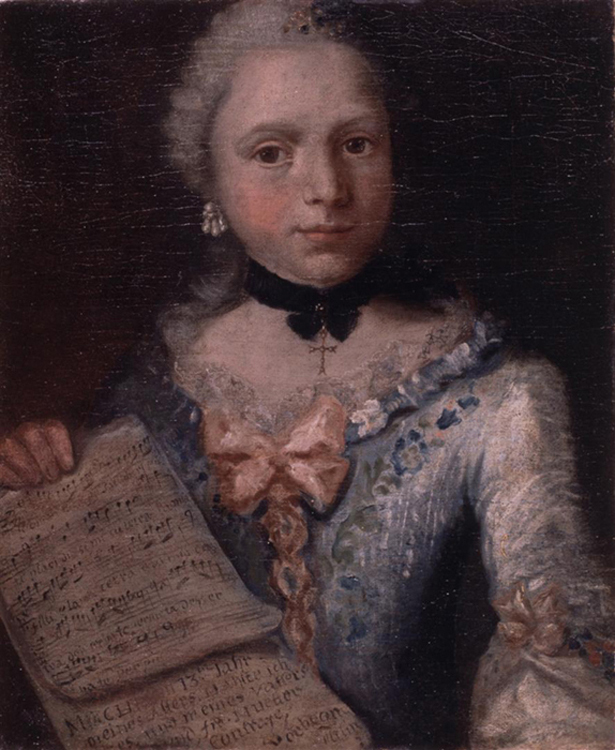 1750 The 9-year-old draws her first portraits in pastel. 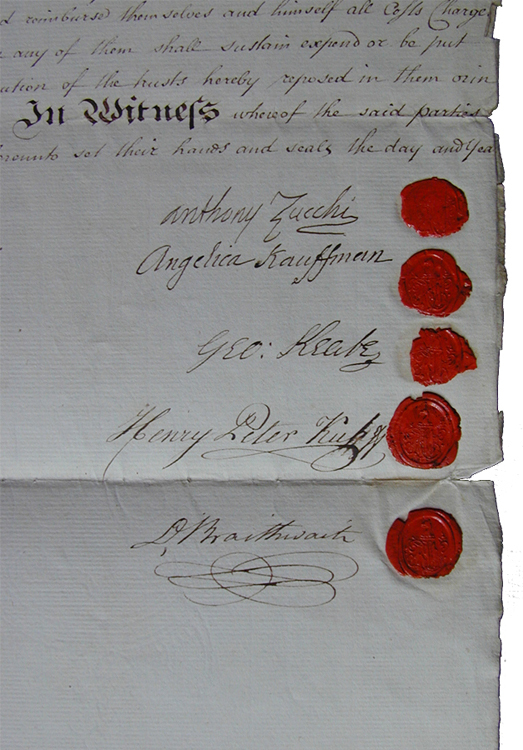 1752The father arranges for Franz Joseph Kauffmann, his son probably by his first marriage, to come and live with the family. He gives the two children joint lessons in art. The family moves to Como in Lombardy, at that time governed by Austria, where the father’s most important patrons, and subsequently also those of the daughter, are the ruling counts of Salis. Arround 1753 First Self-portrait as Singer, Holding a Sheet of Music (Ill. 12); she takes singing lessons. 1754-1757 First trip to Italy. 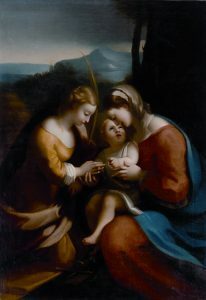 Based in Milan at the court of Duke Modena d´Este, paints portraits of the Duchess of Modena, Archbishop of Milan Cardinal Pozzobonelli, and the Austrian diplomat Count Karl Joseph von Firmian; makes first copies after Old Masters. 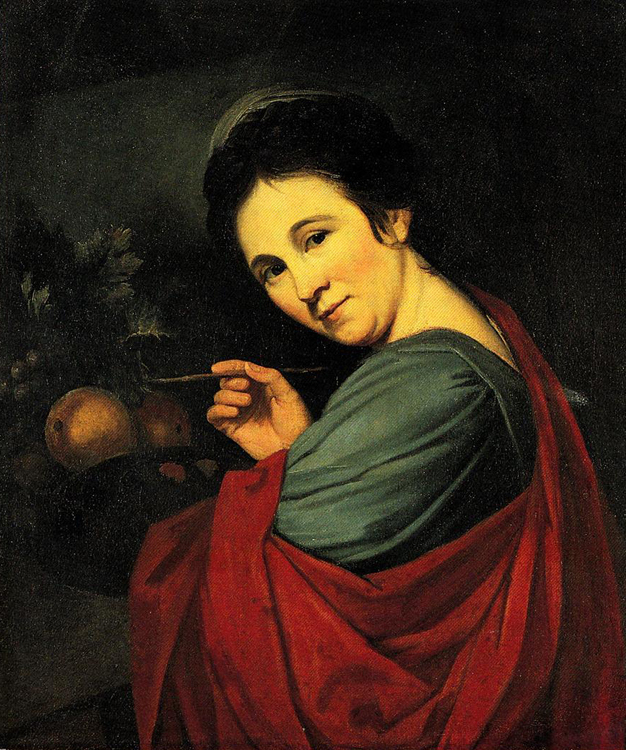 1.3.1757 After the death of her mother in Milan, she decides not to pursue her singing but to concentrate upon a career as a painter: Self-portrait Hesitating between the Arts of Painting and Music (Ill. 13). 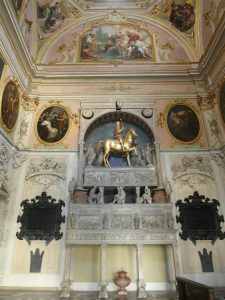 Father and daughter paint ceiling and wall frescos in the Holy Trinity parish church in Schwarzenberg, the paintress’s only works in fresco. 1758-60 Portrait commissions in Meersburg and at Neues Schloss Montfort in Tettnang. from c. 1758/59 Second Italian trip, with a first stop in Milan. 1761/62 Stopovers in Piacenza, Parma (studies Correggio), Reggio, Modena and Bologna (studies Guido Reni and Annibale Carracci). 5. 10. 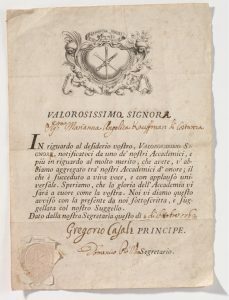 1762 Honorary membership of the Accademia Clementina di Bologna (Ill. 8). from June 1762 In Florence she is given a separate studio in the Medici collection, since it is not considered proper that a woman artist should work in the same room as men. She makes copies after G. Cagnacci, Domenichino, Guercino (see Ill. 23), Raphael, Rembrandt, A. Tiarini and F. Vanni. 10. 10. 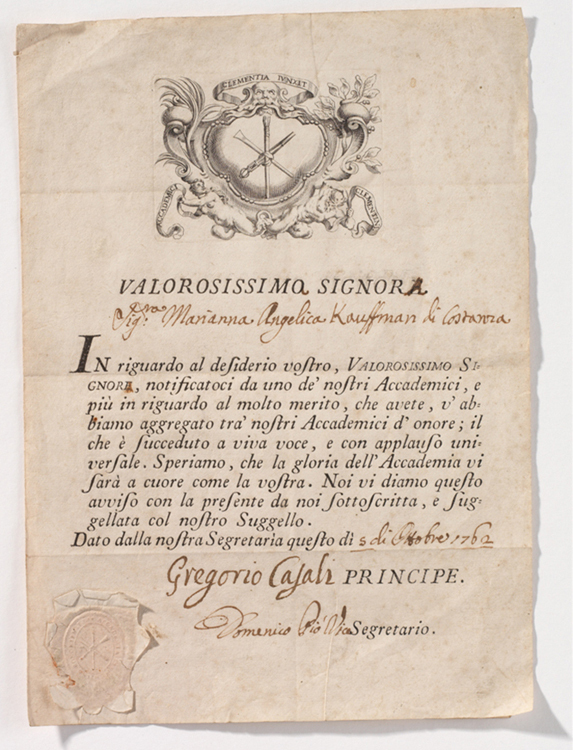 1762 Elected a member of Florence’s Accademia di Disegno. Makes important contacts with British visitors on the Grand Tour and paints numerous portraits; friendship with the American painter Benjamin West, later director of the R.A. in London. Introduced to Johann Friedrich Reiffenstein (1719–1793) (Ill. 24). First etchings, such as Susanna and the Elders. 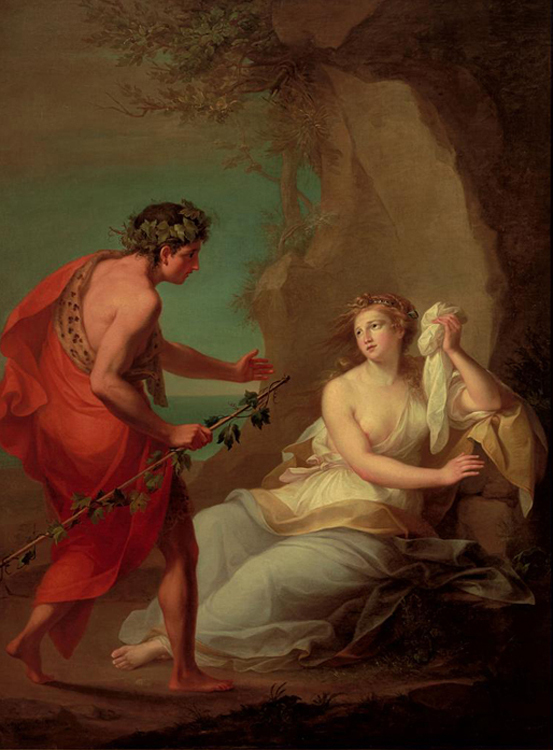 from 1763 Her first visit to Rome inspires her to attempt her first large-format history paintings in the classicist style, such as Bacchus and Ariadne (Ill. 25). Studies antiquities and makes illicit studies of male nudes [PDF-File]. 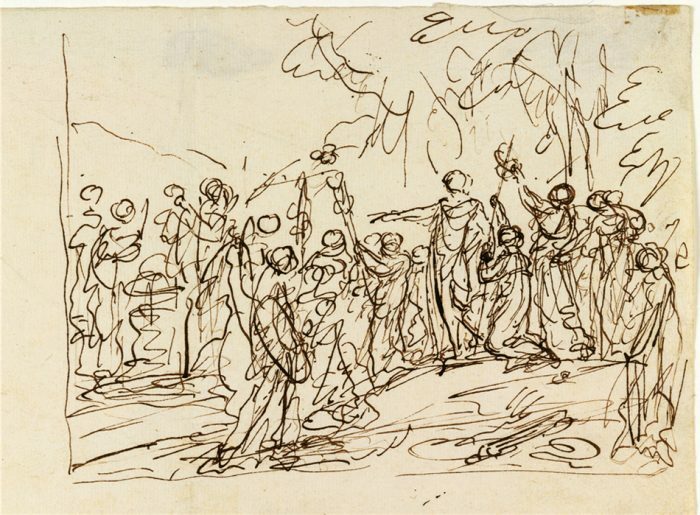 July 1763–April 1764 In Naples, copies works in the Galleria di Capodimonte (Ill. 26). Portraits chiefly of English and Scottish visitors on the Grand Tour, who will also patronize her in London: John Parker, later 1st Baron Boringdon; Brownlow Cecil, 9th Earl of Exeter, and the actor David Garrick. 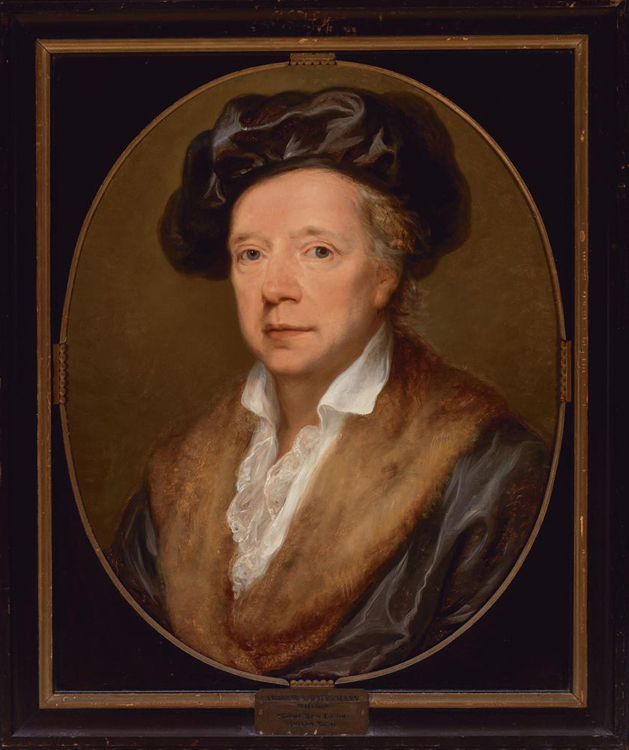 April 1764 Returns to Rome, where her portrait of archaeologist Johann Joachim Winckelmann (Zurich, Kunsthaus, 1764) secures her professional breakthrough [Image Gallery]. She is courted by English painter Nathaniel Dance and the Alsatian flautist Jean Gaspard Weiss. 5 May 1765 Elected a member of the Accademia di San Luca; paints Hope (Rome, Galleria Accademia di S. Luca) as her reception piece [Image Gallery]. Her portrait of David Garrick [Image Gallery], exhibited at the Free Society of Artists, makes her a well-known name even before her arrival in London. from July 1765 Travels for the first time without her father via Bologna to Venice, and in the company of Lady Bridget Wentworth Murray, wife of the British ambassador, from Venice to London. During a stopover in Paris, she particularly admires works by Peter Paul Rubens. from June 1766 Opens a large studio in London, first in Suffolk Street, Charing Cross, later in Golden Square. She visits Joshua Reynolds in his studio; Reynolds is a supportive colleague and each paints the other’s portrait (Ill. 27). from 1766 Thanks to a network of female patrons and good contacts with the English court, her career in England takes off: commission from the Queen Mother for a portrait of her daughter Augusta, Duchess of Brunswick, with her Son Karl Georg August (London, The Royal Collection, Buckingham Palace); commission from Charlotte Sophie, Queen of England, for her Portrait with Prince George IV as the Genius of the Arts (form. London, The Royal Collection, Buckingham Palace) [Image Gallery]. Her work is reviewed favourably in the English press. Spring 1767 Her father Johann Joseph Kauffmann comes to London, bringing with him her cousin Rosa Florini, who later marries the architect Giuseppe Bonomi the Elder. November 1767 Secretly weds Count Frederick de Horn, who turns out to be an impostor and fortune hunter. 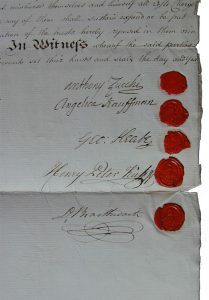 February 1768 Marriage to the self-styled Count de Horn declared invalid. Takes part in the Free Society of Artists exhibition in London in honour of Christian VII (see WVZ, Image Gallery) with three innovative history paintings after Homer and Virgil, including Penelope Taking Down the Bow of Ulysses (Plympton, Saltram House, form. collection of John and Theresa Parker). December 1768 Named a Founding Member of Royal Academy of Art. Alongside still-life artist Mary Moser, she will remain one of the only two female Academicians for the next 200 years (Ill. 28). 1769 Shows ground-breaking history paintings at the opening exhibition at the Royal Academy: Hector Taking Leave of Andromache; Venus Showing Aeneas and Achates the Way to Carthage and Achilles Discovered by Ulysses amongst the Daughters of Lycomedes. 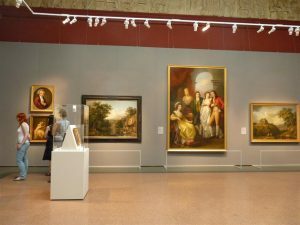 At the instigation of Lady Theresa Parker, the whole series is acquired for Saltram House [http://www.nationaltrust.org.uk/saltram]. Correspondence with the poet Friedrich Gottlieb Klopstock. from 1770 History paintings of scenes from ancient and medieval British history: Vortigern, King of Britain, Enamoured with Rowena at the Battle of Hengist, the Saxon General (Plympton, Saltram House, The National Trust), Queen Eleanor Sucking the Poison from her Husband King Edward I’s Wound (Ill. 29) These paintings set the standard for British national history painting until well into the 19th century. 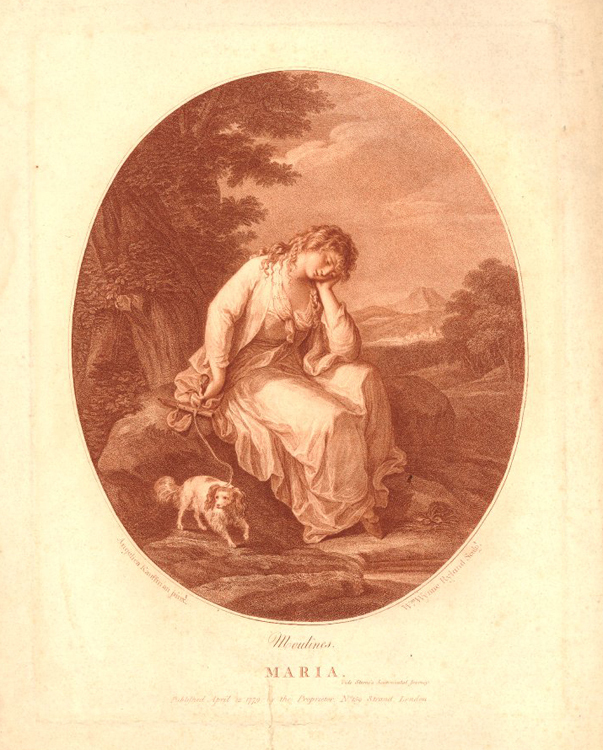 Her love of literature and her friendships with the leading literati of her day inspired her to create new pictorial inventions: Inibaca Discovering Herself to Trenmor from James Macpherson’s Ossian, and Poor Maria, one of her most widely known motifs, from Laurence Sterne’s A Sentimental Journey. Starts working with William Wynne Ryland and numerous other engravers. [Reproductive Prints] (Ill. 30). 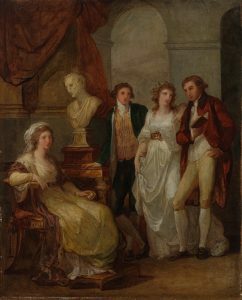 Summer 1771 Six-month trip to Ireland, where she paints portraits of numerous members of the Irish gentry, including Lord Ely and his family and Lord Townshend [http://www.nationalgallery.ie/Collection]. from 1772 Produces etchings in collaboration with her future brother-in-law Giuseppe Carlo Zucchi. 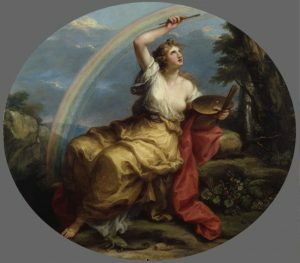 1773 Alongside Joshua Reynolds, Nathaniel Dance, James Barry and Giovanni Battista Cipriani, she is selected to decorate St Paul’s cathedral with history scenes. The project is never realized. 1775 She objects to The Conjurer, a painting by Nathaniel Hone satirizing Reynolds and herself, and succeeds in having it removed from the exhibition at the Royal Academy. from 1776 Her oil pictures are reproduced by Matthew Boulton as ‘mechanical paintings’, allowing series of them to be used in interior decoration. 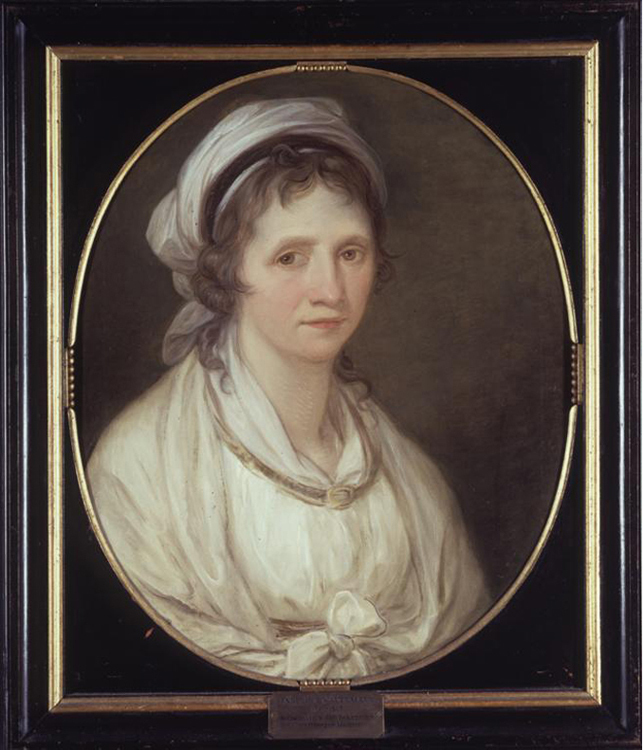 from 1778 Price lists of her paintings testify to her commercial success. 1780 She completes the prestigious commission for four magnificent ceiling paintings, Invention, Composition, Design and Colouring, for Somerset House, home of the Royal Academy (Ill. 31-34). W. W. Ryland exhibits 146 engravings after her paintings. The Kauffman vogue has reached its peak. 1781 Marriage contract and marriage to the Venetian painter Antonio Zucchi [Ill. 16, PDF-File]. New edition of her etchings, including aquatints in brown and red, by London publisher John Boydell. July 1781 Leaves London and travels via Flanders, a stopover in Schwarzenberg, Innsbruck and Verona to Padua. October 1781 – April 1782 In Venice, she is introduced to the future Tsar Paul I of Russia and his wife Sophie Dorothea Auguste of Württemberg (Leonardo da Vinci Dying in the Arms of Francis I, 1782) and works for leading noble families in Northern Italy. 1781-1796 Antonio Zucchi publishes the Memorie delle piture[sic] fatte d’Angelica Kauffman (continued up to 1798 by the artist herself), in which he supplies information about his wife’s most important paintings and her international clientele, including many patrons from Poland and Russia, such as Prince Nikolai Yusupov of Russia and Stanislaw II Poniatowski, King of Poland (Ill. 35). 1782 Death of her father and her paternal aunt Anna Maria Florini in Venice; honorary membership of the Accademia di Venezia. May 1782 Moves with her husband into a palazzo formerly occupied by Anton Raphael Mengs near Trinità dei Monti in Via Sistina, Rome. Opens one of the city’s most prestigious studios, in which her husband assists her. Summers of 1782 and 1784 During two summer visits to the Neapolitan court of Queen Maria Carolina, she prepares the monumental portrait of the Royal Family of Ferdinand IV and Maria Carolina of Naples and their Children [Image Gallery]. 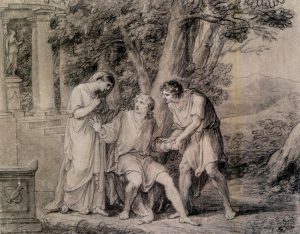 December 1784 Upon the visit of Emperor Joseph II of Austria, receives commissions for two major history paintings (Hermann Crowned by Thusnelda; Aeneas Mourns Pallas, the Son of Evander, Killed by Turnus (both Vienna, Kunsthistorisches Museum, wartime loss)) (Ill. 36) [Image Gallery]. Summer 1785 At the court of Naples, she gives the princesses drawing lessons but declines the invitation to become court artist. 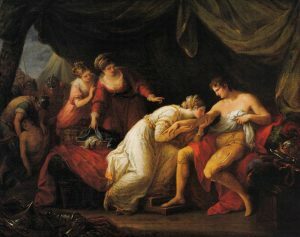 Multi-figural history paintings, including Servius Tullius and Achilles Discovered by Ulysses amongst the Daughters of Lycomedes (1789) for Catherine the Great; Cornelia, Mother of the Gracchi [Reception] and Julia, Wife Of Pompey, Faints at the Sight of his Bloodstained Garment (Weimar, Kunstsammlungen zu Weimar) for Maria Carolina; Pliny the Younger and his Mother at the Eruption of Vesuvius and Virgil on his Deathbed for George Bowles. from 1785 Buys a villa near the papal residence in Castel Gandolfo, where she spends the summers with friends. 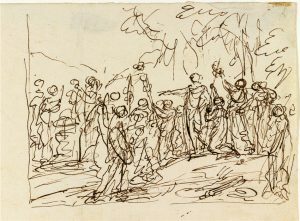 She supports and encourages many young artists, including Giovanni Battista Dell´Era, who copies her works [copyists & followers]. 1785/1786 G. G. de Rossi publishes a first in-depth appraisal of her life and work in the journal Memorie per le Belle Arti, in which she is described as the “paintress of the Graces” (pittrice delle grazie) and “mother of the arts and artists”. 1786-1788 Johann Wolfgang von Goethe comes to Rome. Kauffman becomes a close friend and paints his portrait [Gossip]. 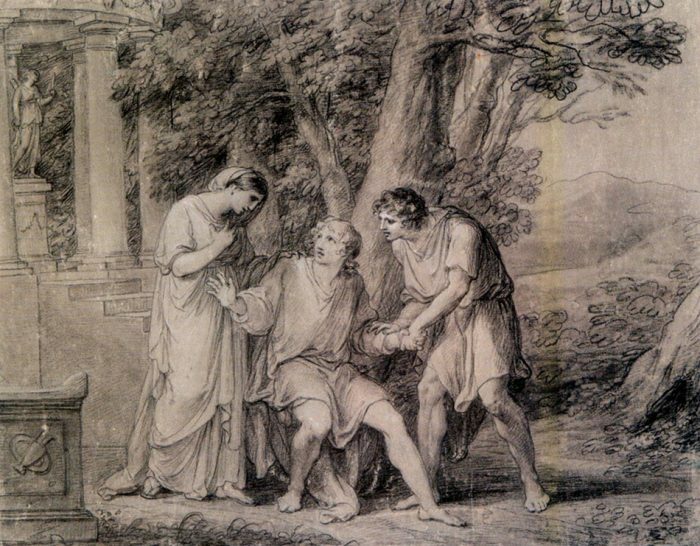 Goethe reads from his play Iphigenia in Tauris in her salon, and she draws an illustration for it, which she gives to him [Reception] (Ill. 37). Her lively salon is attended by prominent guests, including British collector and banker Thomas Jenkins, sculptor Antonio Canova, engravers Domenico Cunego, Raphael Morghen and Giovanni Volpato, Goethe’s friend Magdalena Riggi, gem-cutter Giovanni Pichler and Louise von Anhalt-Dessau. 1788 Duchess Anna Amalia of Saxe-Weimar-Eisenach visits Rome in the company of the poet Johann Gottfried Herder. Kauffman is one of the most intimate members of the Weimar circle of artists, which includes Johann Friedrich Reiffenstein, Friedrich Bury, Jakob Philipp Hackert, Aloys Ludwig Hirt and Johann Heinrich Wilhelm Tischbein [Reception]. 1789 Paints the portrait of Johann Friedrich Herder (Frankfurt/M., Goethe-Museum). Her Self-portrait for the Grand Duke of Tuscany’s famous gallery of artist self-portraits is hung next to that of Michelangelo (see Ill. 18). Publisher John Alderman Boydell invites her to contribute to his Shakespeare Gallery, confirming that she still holds a firm place amongst England’s best figure painters. Italy’s leading artists, including Kauffman, are commissioned by Cardinal Francesco Carrara to paint biblical scenes for the Cappella Bartholomeo Colleoni in Bergamo (Ill. 38). 1791 Receives her first and only commission from Pope Pius VI to paint an altarpiece for the Cappella Svizzera in Santa Casa in Loreto. This year she also completes her major Self-portrait Hesitating between the Arts of Painting and Music (Ill. 13), the portrait of ‘Attitudes’ artist Emma Hamilton, Lady Hamilton as Comic Muse, and the large portrait of Princess Catherine Petrovna Baryatinskaya, née Princess of Holstein-Beck, with her family (Ill. 39). 1792 Fortunata Sulgher Fantastici and Teresa Bandettini-Landucci de Lucca, both virtuoso performers of extemporary verse, attend her salon and honour her with poems. She meets the paintress Elisabeth Vigée Le Brun (see Ill. 19), in exile during the French Revolution. Kauffman’s salon is considered a “temple of female fame”. 26.12.1795 Death of her husband Antonio Zucchi. 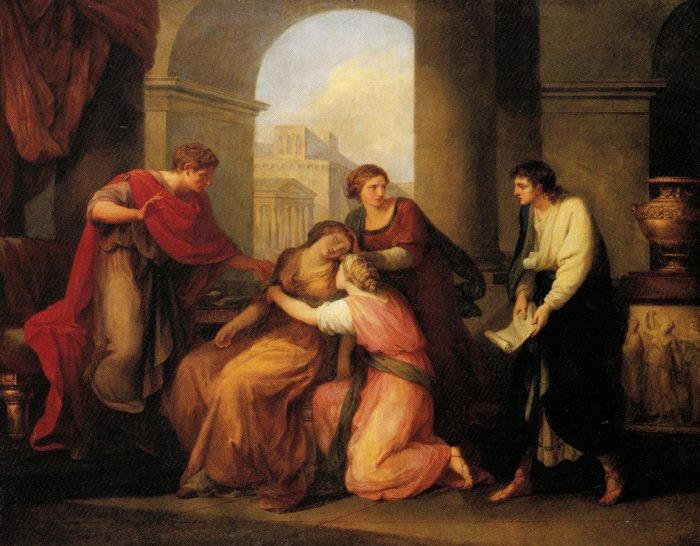 Her cousin Johann (Giovanni) Kauffmann comes to Rome to provide her with support. 1798 French troops occupy Rome. Her studio is spared from looting, but her finances are adversely affected by devaluation. ca. 1801 Last self-portrait (Ill. 21). 1802 Health trip to Como in the company of her cousin Giovanni Kauffmann; stopover in Venice, return journey via Padua, Rovigo, Ferrara, Bologna and Florence. She gives The Coronation of the Virgin to the parish church of Schwarzenberg in Vorarlberg as an altarpiece [Image Gallery]. 1803 Friendship with writer Friederike Brun and her daughter, ‘Attitude’ actress Ida Brun [Reception]. Draws up a new will, burns letters and promissory notes and makes provision for a foundation for the poor. ab 1804 New editions of her etchings published by John P. Thompson in London. 1805 Visit and last major portrait commission from Crown Prince Ludwig I of Bavaria. 1806 Summer trip to Albano for a health cure for her rheumatism; she completes probably her last religious history painting, the Birth of St John the Baptist, for Count Francesco Martinengo da Barco in Brescia. 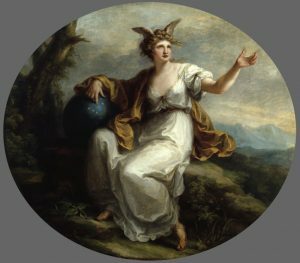 5.11.1807 Angelica Kauffman dies after a short illness. The Accademia di San Luca organizes a magnificent funeral ceremony, in which Kauffman’s last major paintings are carried behind her coffin. A huge crowd attends the burial service in S. Andrea delle Fratte. She leaves behind a rich collection of art and book and bequeaths generous legacies to her relatives in Vorarlberg. 1809 Her portrait bust (Ill. 22), carved by her cousin Johann Peter Kaufmann, is installed next to the bust of Raphael in the Pantheon in Rome. 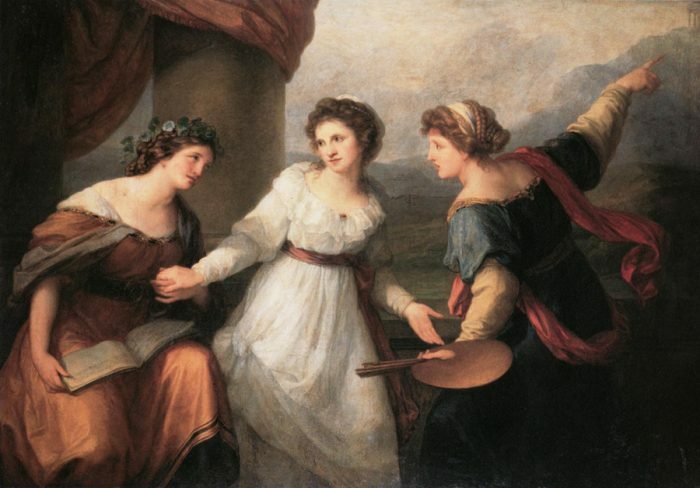 1810/1811 First publication of the Vita di Angelica Kauffmann Pittrice by G.G. de Rossi, on the basis of the unpublished Memorie Istoriche di Angelica Kauffman-Zucchi of 1788/89. 1892/93 Francis Gerard publishes a biography of Angelica Kauffman with a first catalogue of works, primarily those in British collections. 1908 First commemorative exhibition in Austria, in the Vorarlberger Landesmuseum in Bregenz. 1924 Lady Victoria Manners and George Charles Williamson publish a biography with a catalogue of works, chiefly those in English collections, and the Memorandum of Paintings – an English translation of A. Zucchi’s Memorie delle piture – as an appendix. For a long time the book remains the standard work of reference. 1941 First commemorative exhibition in Switzerland, in the Kunstmuseum in Chur. Archivist Claudia Helbok in Vienna works on a catalogue of Kauffman’s works. 1968 Commemorative exhibition in Bregenz (Vorarlberger Landesmuseum) and Vienna (Österreichisches Museum für Angewandte Kunst). 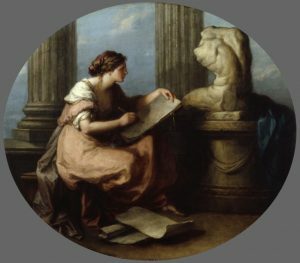 Peter S. Walch writes the first doctoral thesis on Angelica Kauffman at Princeton University (NJ). Claudia Helbok publishes her genealogically detailed biography, but has abandoned the catalogue of works. from 1972 Through Women’s Studies, Kauffman’s works become the focus of increasing attention and are included in exhibitions of female artists (Baltimore 1972, Los Angeles 1975, Berlin 1977 and 1987). 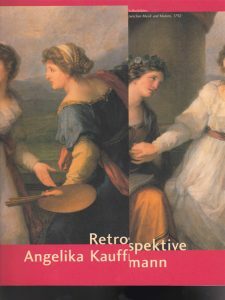 1982 Bettina Baumgärtel begins work on a catalogue raisonné of Angelica Kauffman. 1985 Opening of the Angelica Kauffman Room in the Bündner Kunstmuseum in Chur. 1987 The municipality of Schwarzenberg opens a museum, under the charge of Alfons Bereuter, dedicated to the presentation and temporary exhibitions of the works of A. Kauffman. 1990 Founding of the Angelika Kauffmann Research Project (AKRP) by Bettina Baumgärtel. 1992 Joint exhibition of works by Angelica Kauffman and Marie Ellenrieder in Konstanz (Rosgartenmuseum, Städtische Museen Konstanz). Further exhibitions in Brighton (Royal Pavilion, Art Gallery & Museum), Vaduz (Liechtensteinische Staatliche Kunstsammlung) and Milan (Palazzo della Permanente). 1994 Kauffman’s works are at the centre of “…ihr werten Frauenzimmer auf!”, an interdisciplinary festival in Bremen devoted to women in the Enlightenment. The festival is accompanied by a Kauffman exhibition in the Roselius-Haus. 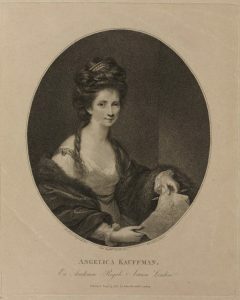 1995 Within the framework of the AKRP, start of systematic scientific analyses for the catalogue raisonné and work on the corpus of sources with an index of letters by, to and about Angelica Kauffman, and other documents relating to her life. 1997 Start of collaboration by the AKRP with conservator Inken M. Holubec. 1998/99 First major “Angelika Kauffmann Retrospektive” in Düsseldorf (Kunstmuseum), Munich (Haus der Kunst) and Chur (Bündner Kunstmuseum), in tandem with the likewise travelling exhibition “Verrückt nach Angelika. 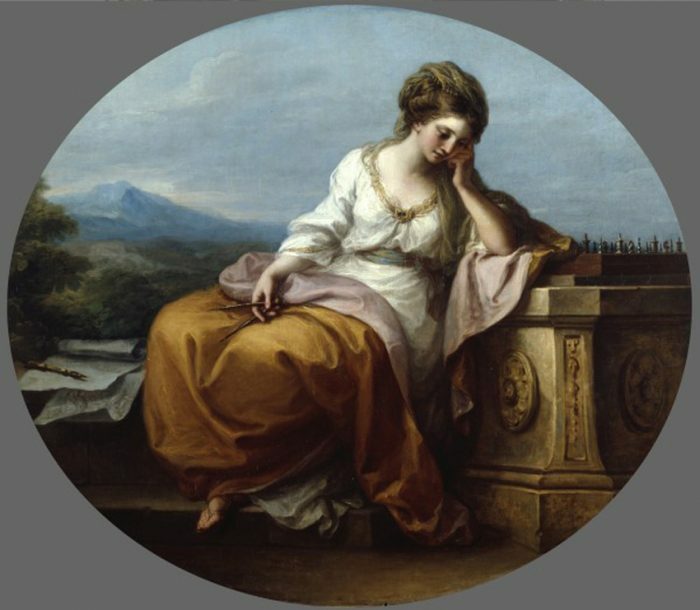 Porzellan und anderes Kunsthandwerk nach Angelika Kauffmann” in Düsseldorf (Hetjens-Museum), Munich (Haus der Kunst) and Chur (Rätisches Museum). (Ill. 40 Exhibition at the Accademia Nazionale di San Luca and Istituto Nazionale per la Grafica, Rome). 2006 Foundation of the association Freunde Angelika Kauffmann Museum Schwarzenberg (Friends of the Angelica Kauffman Museum in Schwarzenberg), Vorarlberg. 2007 Opening of the Angelika Kauffmann Museum Schwarzenberg and start of a series of exhibitions: commemorative exhibition in Schwarzenberg and Bregenz (Vorarlberger Landesmuseum).